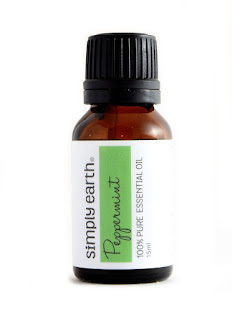 I recently received Simply Earth Peppermint Essential Oil to try out. As usual when I receive something I don't know much about I do a little research before I try it out. I had no idea how many uses there are for peppermint essential oil. It can be used to freshen your breath, soothe nausea and other stomach issues, perk up the senses before a long meeting, and thanks to the menthol this entire plant contains it can even give a cooling effect on overworked muscles. Peppermint can clear congestion, help get rid of headaches, and even help aleviate PMS. Not to mention it makes your house smell so fresh if you use it in a diffuser. Peppermint Essential Oil can even keep insects and rodents out of your house. I know that I'll be keeping peppermint essential oil on hand now. I love that it's all natural and can be used in so many ways!